311 Commonwealth is located on the NW corner of Commonwealth and Hereford, with 32 Hereford to the east, across Hereford, 313 Commonwealth to the west, 31 Hereford to the north, across Alley 429, and 314 Commonwealth to the south, across Commonwealth. 311 Commonwealth was designed by Funk and Wilcox, architects, and built in 1924-1925 as a 14-unit apartment house by the Marden and Orlando Construction Co., the principals of which also were the owners of the building. It replaced a townhouse at 311 Commonwealth built in 1877. Plans for the building, including elevations and floor plans, are included in the City of Boston Blueprints Collection in the Boston Public Library’s Arts Department (reference BIN N-4). Frank Orlando was president of the Marden and Orlando Construction Co, and Louis Marden was vice-president and treasurer. They purchased the original townhouse at 311 Commonwealth on June 20, 1924, from Carroll T. Donahue. He was a clerk with the Daly Plumbing Supply Company and had acquired 311 Commonwealth on March 1, 1923, from real estate dealer William N. Ambler. Carroll Donahue probably was acting as conveyancer on behalf of either William Ambler or the Marden and Orlando Construction Co.
Click here for an index to the deeds for 311 Commonwealth. In July of 1924, the City Building Wrecking Company filed for (and subsequently received) permission to demolish the townhouse at 311 Commonwealth, and construction of the new building began soon thereafter. 311 Commonwealth was completed by the 1925-1926 winter season. Among the first residents were Harold Winthrop Young and his wife, Dala C. (Nordgren) Young. He was secretary of his father’s firm, Frank L. Young Co., oil merchants, and later would become a trustee of estates. They also maintained a home in Duxbury, which previously had been their primary residence. By the next season, they had moved to 77 Myrtle. Also among the first residents were Jerome Kenneth Crossman and his wife, Pauline (Gans) Crossman (shown as “Crossland” in the Blue Books). Pauline Crossman’s sister, Rebecca Gans, and their mother, Carrie (Lipsitz) Gans, the widow of Marks Lisso Gans, lived with them. They all previously had lived in an apartment at 534 Beacon. Jerome Crossman had been an attorney in Dallas before their marriage in September of 1920; Pauline Gans and her family also had lived in Dallas. They married in New York City and then moved to Boston, where he became sales manager of a roofing materials company. They continued to live at 311 Commonwealth during the 1927-1928 season, but moved thereafter and, by the early 1930s, were living again in Dallas, where he had resumed practicing law. On March 22, 1926, real estate dealer Joseph L. Rome foreclosed on a mortgage given by Louis Marden and Frank Orlando, and took possession of 311 Commonwealth. The property changed hands and on November 2, 1927, was acquired by Bernard Brooker, a dealer in building materials and later a real estate dealer. 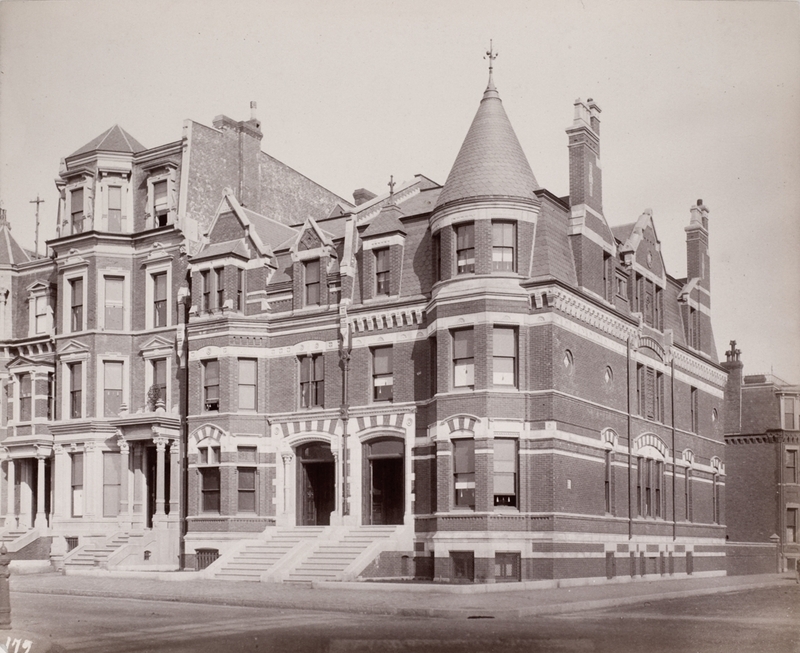 In December of 1927, he filed for (and subsequently received) permission to convert 311 Commonwealth from fourteen apartments into medical offices. Thereafter, the building was known as the Medical Arts Building. On May 8, 1929, 311 Commonwealth was acquired from Benjamin Brooker by his wife, Esther (Friedman) Brooker, and Augustus Roberts, president of the Columbia Wood Works, as trustees of the Medical Building Trust. On March 10, 1937, the Worcester North Savings Institution foreclosed on a mortgage it held on 311 Commonwealth and took possession of the property. On November 24, 1937, it was acquired from the bank by real estate dealer Ray C. Johnson. The property changed hands, remaining a medical office building, and on May 29, 1951, was acquired by Saul I. Shray, as trustee of the 311 Commonwealth Ave. Trust. Saul Isadore Shray (Nisen Schrei) and his wife, Anna (Mann) Shray, lived in Chelsea. He was the owner of the Hub Barbecue in Scollay Square. Their son, Leo Shray, managed the restaurant. Anna Shray died in 1950 and on June 25, 1951, he transferred 311 Commonwealth into his own name. On January 2, 1968, 311 Commonwealth was acquired from Saul Shray by Jerome S. Bartzoff and Daniel S. Shoostine. Saul Shray and his son, Leo, both died in September of 1968. On October 30, 1975, Saul Shray’s son, Milton Harold Shray, as executor of his father’s estate, foreclosed on a mortgage given by Jerome Bartzoff and Daniel Shoostine and took possession of the property. As executor, Milton Shray held one-half interest for his own benefit and one-half interest for the benefit of the three children of his brother, Leo Shray: Laura W. (Shray) Slater, the wife of Richard R. Slater; Paula Marlene Shray, and Miriam N. Shray. On December 18, 1975, Milton Shray filed for (and subsequently received) permission to convert the property into fifteen apartments and one medical suite. On February 2, 1976, 311 Commonwealth was purchased from Saul Shray’s estate by Glen G. Grant, trustee of the 311 Commonwealth Avenue Trust. 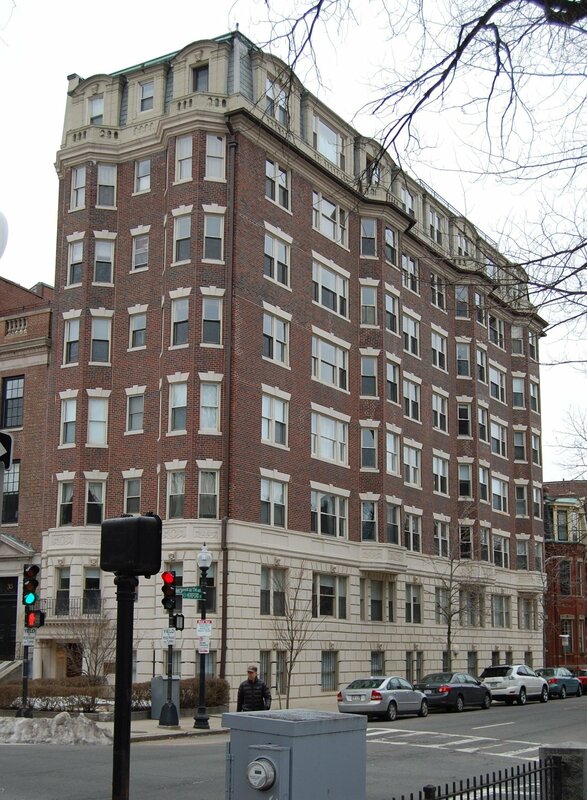 On April 20, 1976, he converted the property into fifteen condominium units, the 311 Commonwealth Avenue Condominium. 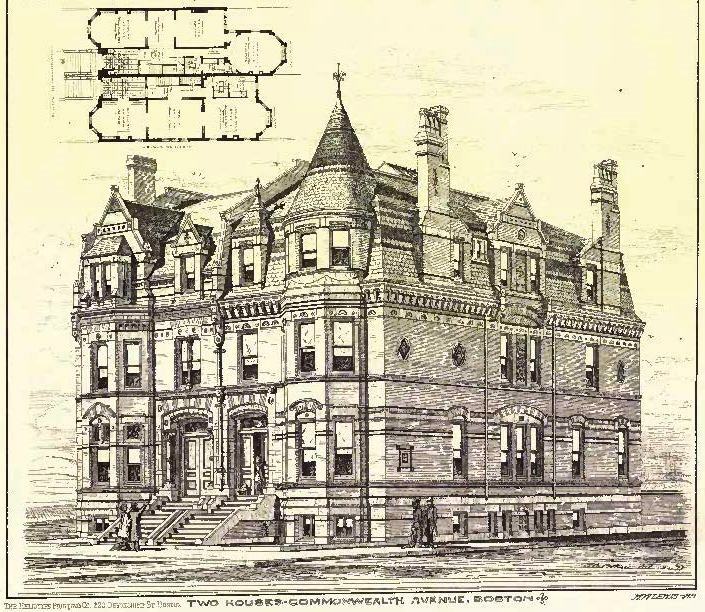 The original house at 311 Commonwealth was designed by architect William Whitney Lewis and built in 1877-1878 by Woodbury & Leighton, masons, and John Morrison, carpenter, one of two contiguous houses (311-313 Commonwealth). It was built as the home of Thomas Dana, II, and his wife, Mary Catherine (Baldwin) Dana. He is shown as the owner of 311 Commonwealth on the original building permit application, dated August 15, 1877, and on the final inspection report dated November 4, 1878. Thomas Dana, II, purchased the land for 311 Commonwealth on April 24, 1877, from Grenville T. W. Braman, Henry D. Hyde, and Henry M. Whitney, trustees of a real estate investment trust that had purchased several parcels of land on March 1, 1872, from the Boston Water Power Company. 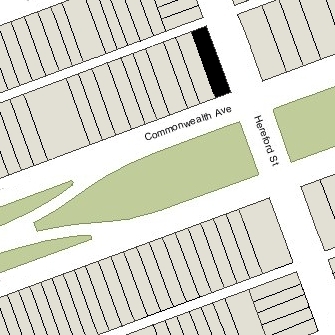 Click here for further information on the land on the north side of Commonwealth between Hereford and Massachusetts Avenue. By the 1879-1880 winter season, Thomas and Mary Dana had made 311 Commonwealth their home. They previously had lived at 168 West Newton. Thomas Dana, II, was a wholesale grocer in partnership with his first cousin, once removed, Thomas Dana, who was married to his aunt, Elizabeth Dana. Thomas and Elizabeth (Dana) Dana lived in Cambridge until Thomas Dana’s death, after which Elizabeth Dana moved to 315 Commonwealth. Thomas and Mary Dana’s son, William Franklin Dana, a lawyer, lived with them. Thomas Dana, II, was a director of the Maverick National Bank and in October of 1891, the bank failed. Asa Potter (of 29 Fairfield), the bank’s president and principal owner, Jonas H. French (of 128 Commonwealth), the other principal owner, and Thomas Dana were indicted on various charges, including embezzlement and violating federal banking laws. In November of 1891, Thomas Dana’s wholesale grocery firm was dissolved, having received substantial loans from the bank. The bank held a mortgage on 311 Commonwealth which was transferred to the banks receivers, Charles Kellogg and Thomas P. Beal. Thomas Dana subsequently defaulted on the mortgage. The Danas moved to Newton and he became a selling agent for the National Pure Food Company. On March 9, 1892, 311 Commonwealth was purchased from the Maverick National Bank’s receivers by Mary E. (Gill) Ropes, the wife of Joseph Augustus Ropes. At the time of the purchase, Joseph and Mary Ropes were residents of Swampscott. They appear not to have occupied 311 Commonwealth for several years and probably were traveling abroad. The house was not listed in the 1893-1896 Blue Books. By the 1896-1897 winter season, however, they had made it their Boston home. They also maintained a home in Salem. Joseph Ropes died in October of 1911. 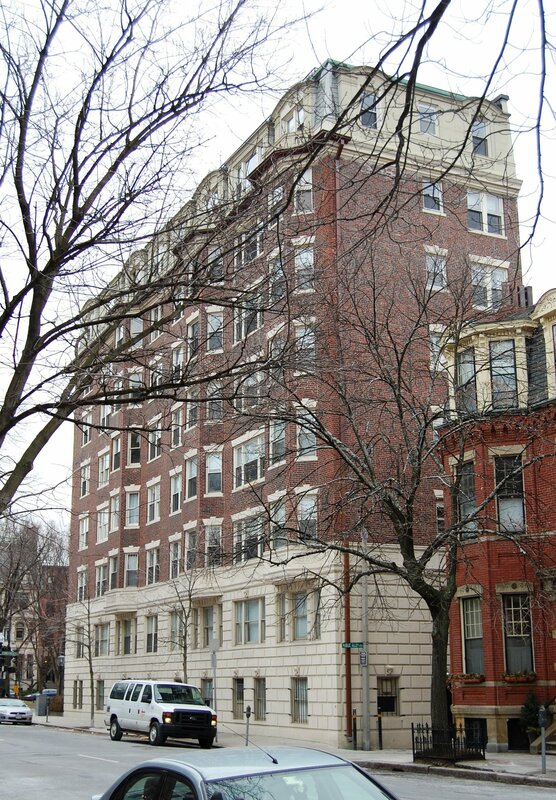 Mary Ropes continued to live at 311 Commonwealth until her death in 1922. On October 10, 1923, 311 Commonwealth was purchased from Mary Ropes’s estate by real estate dealer William N. Ambler. On June 20, 1924, it was acquired by Louis Marden and Frank Orlando of the Marden and Orlando Construction Company. It was razed later that year.